Anti-Aging Serum, Sun Protection and Beautiful Skin in One – CC+ Your Skin But Better Cream by IT Cosmetics. Review and Swatches. It all sounded too good to be true: From evening out your skin tone and giving you sheer coverage and a natural finish, they were supposed to be hydrating and protecting, offering many more add-ons, i.e. pore minimizing and anti-aging properties etc. But it would soon show, that the quality of BB Creams sold in Western European and North American markets, didn’t quite live up to the expectations. They weren’t quite the allrounders they were marketed as. In my personal opinion, the old generation of BB Creams perform no better than simple tinted moisturizers. Some of them especially not worth the money considering their claims. I did have the opportunity to try some authentic Asian BB Creams that a friend of a friend of mine got from Korea. The most obvious difference clearly was to be found in the coverage. These Asian products had a much thicker and creamier consistency with full coverage. They did make my skin look a lot better in terms of evening out the skin tone, appearance of pores and redness – just like a good foundation would. However, I did not have such a pleasant experienc with the first BB creams that were sold over here and in Europe (poor coverage, oxidization, poor shade range). But after reading a lot of reviews, I was curious enough to give it another try. One of the most raved about products was the CC+ Your Skin But Better Cream by IT Cosmetics. The CC+ Cream comes in a 32 ml/1.08 fl. oz. tube with a pump and retails for $38. I haven’t had any difficulties with the pump dispensing the product, it works fine so far. The cream contains a mix of anti-oxidants like vitamin C, therefore the packaging is airtight and opaque, to make sure the ingredients aren’t exposed to light (especially vitamin C is known to lose its benefits and to oxidize and turn orange when exposed to light and air). Note, that the strip of color that is shown on the tube of the CC+ Cream is printed on the packaging. It is not clear packaging, but colored, to exemplify the particular shade. So, well thought out packaging to protect the active ingredients. A general tip – When it comes to skincare products and makeup products that have skin beneficial ingredients like anti-oxidants: Not only read the ingredients list, but also take a close look at the packaging. The best ingredients won’t be of any use to you, if not enclosed in proper packaging! That said, go for packaging in tubes rather than jars (also more hygienic); pump dispensers (hygienic and practical); airtight containers that also keep the product away from light. In summer, I also like to store my skincare products and other creamy or liquid makeup in the refrigerator. And toss away old expired or smelly products. The cream comes in 5 shades: Fair, Light, Medium, Tan and Rich. Now, often BB and CC creams don’t have the kind of coverage that a regular foundation provides (and they don’t have to, since they claim to have a no-makeup look and feel). But because of the sheer coverage, they tend to not offer a lot of shades. The reason for that is, they blend into the skin and adjust to skin tones a lot better than a classic foundation with medium to full coverage will. Still, this is a downside to the CC+ Your Skin But Better Cream in particular. I had to buy two shades (Medium and Tan) to find my perfect match. I also read many other reviews on this product and people seem to have difficulties finding their match (especially very pale neutral toned and darker skin types). When I look at Laura Mercier’s shade range of her tinted moisturizer line for example, I’m thinking IT Cosmetics should definitely improve theirs. You do spend a decent amount of money on the product, so I think you should be able to pick from more than just five generic shades – especially with a product that has a medium buildable coverage. On the other hand, I have a darker shade now for when I tan in the summer, and a lighter one for winter, when I am going to be paler. I haven’t swatched the Rich shade for this review and I have yet to try it out on someone with dark skin. So, all I could do for now, was to look up swatches from other beauty bloggers. The same applies to the light shades. Reading other reviews, I am not sure if everyone will find their perfect match in the current shade range. I haven’t, and my skin tone is pretty average. Ingredients and Physical Sunscreen: The CC+ Your Skin But Better Cream contains a lot of beneficial ingredients that are supposed to nourish and protect your skin. It has a non-chemical mineral based sunscreen (SPF 50 UVA/UVB; Titanium Dioxide and Zinc Oxide), anti-aging vitamins, peptides and on top of the ingredients list: snail secretion filtrate. There doesn’t seem to be enough substantial evidence in (independent!) clinical studies yet, to tell if this ingredient really delivers what it promises (like extensively researched retinoids for example). However, it is one of those ingredients that the beauty and skincare industry has discovered some time ago already and that is currently being used by some to market a number of products. 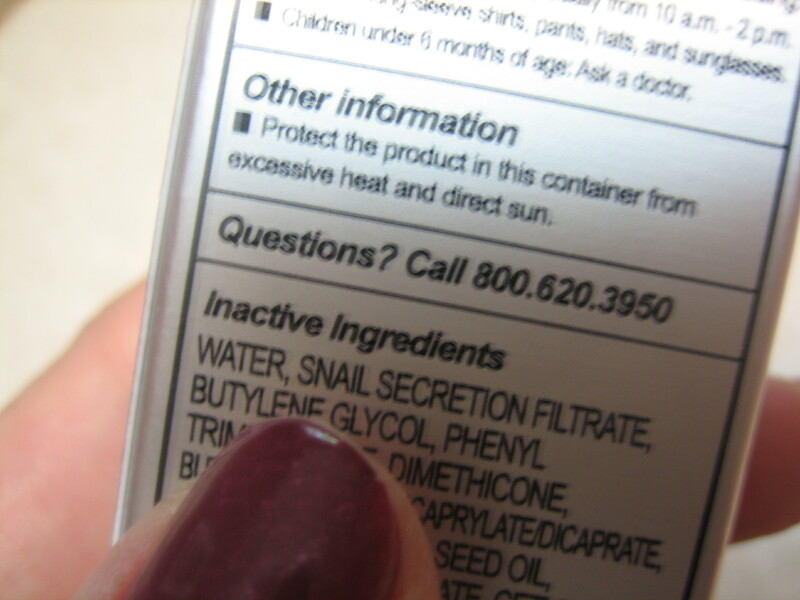 (Snails though have been used for quite some time now for cosmetic treatments). It is said, that snail secretion filtrate is perfect for hydrating the skin and also has healing properties (it is used in both hydrating masks and acne creams as well, to treat scarring and inflammation, for example). Cruelty-free and Not Tested on Animals: What was important to me was, that they use a cruelty-free way of incorporating the ingredient as a filtrate. Be assured: The secretions are being collected from flowers that snails have left on them, while moving over those flowers. It’s a cruelty-free product and has not been tested on animals. If you’re grossed out by this particular ingredient, you may want to skip it. Honestly, I don’t mind at all. It is, after all, natural and you wouldn’t want to know about all the animal by-products in other stuff you’ve probably already put on your face or ate. It’s a filtrate, so it has been “cleaned” from debris etc. Skin Type Recommendations: This product is not really being marketed towards a specific skin type. However, it is hydrating and leaves a nice dewy finish without making you look shiny. I have combination skin with drier patches on my cheeks and around my nose and mouth area, but my t-zone tends to get oily after a while. For my combination to oily skin it worked perfectly. It doesn’t have a pasty matte finish that can make the skin look and feel dull, and it wasn’t shiny at all either. I usually don’t even set it with a powder. Note that I live in New Mexico, a high desert with dry air and lots of sun. From my personal experience, I think it might not be hydrating enough for very dry skin. Also, people who have very oily skin might feel this product coming off or moving around after a while. Since it has a built-in sunscreen, the packaging instructions say to reapply every 2 hours. If you are out in the sun, I’d definitely recommend doing so. Applying it with your fingers is fine and working it in with the warmth of your hands. My preferred method though is to use a brush because I get a more sheer and natural looking finish this way. I also use less product this way. In the swatches I’ve used Ecotools’ Custom Coverage Buffing Brush, which worked fine but I actually prefer my Real Techniques’ Expert Face Brush for this purpose (it’s ideal for this kind of creamy consistency, see the full review here). It’s easy to blend and buff into the skin. The consistency is rather thick and creamy and the product tends to dry and set rather quickly, so you have to work quickly too. The texture is completely different to the new water based liquid foundations, for example. If you have oily skin, live in a humid area or just prefer to use a powder, you may want to set it with one to make sure it stays put. Also, if you have very oily skin, you would probably have to blot in between touch ups. I have found that a sheer layer, which I prefer for everyday use, gives you a nice dewy natural finish. Building it (2 instead of 1 pump) can actually give you a more matte finish. – This might be another option for people with very oily skin or acne scars. My tip for an air brushed finish and more coverage: To really blur out the pores on the cheek and nose, I’d recommend to just lightly go over particular areas again in a dabbing motion or with a stippling brush. This way you get another thin layer without wiping the product around. It helps in achieving the “air brushed” look and hides pores and imperfections even better than just buffing the product in. With this technique I can reach full coverage with this cream. Lasting Powder and Setting: For me it stayed put all day. I don’t have to touch up (unless I am out in the sun for long) or set it with powder. I get slightly the same results with or without a primer and in my experience it looks even better after a couple of hours – very natural; dewy; like real skin. I prefer a dewy look though. Normally, I wouldn’t do this of course, but even leaving on the product overnight caused no reactions or breakouts at all. Personally, I like the citrusy fragrance of the cream. However, it doesn’t linger in case you’re bothered with perfumes or scents. I am very happy with the CC+ Your Skin But Better Cream by IT Cosmetics and use it every day. Even for people with oily skin I would recommend trying it out, unless you have very oily skin and/or you are looking for a matte and long lasting finish. It’s best suited for people with normal to dry and normal to oily skin, particularly combination skin. Very good buildable coverage (dark under eye circles and spots still need a concealer like with any “real” foundation). Evens out skin tone and covers minor blemishes and redness. Beautiful finish if you prefer a dewy look: natural, skin-like finish with a subtle glow (for best results buff it into your skin with a brush and then stipple or dab on another thin layer over areas that need it). Minimizes pores (best achieved with a brush). Hydrating and feels like you are not wearing anything. Adjusts to skin tone without oxidizing. Non-chemical sunscreen with SPF 50 UVA/UVB (in some cases chemical sunscreen can cause a rash or make the skin feel itchy). Beneficial ingredients for your skin, i.e. anti-oxidant vitamins, peptides, hyaluronic acid (effectively helps to build and maintain hydration levels in the skin; has anti-oxidant properties; plays an important role in collagen synthesis etc. ), Dimethicone (slipping agent; leaves a protective barrier on the skin and fills in fine lines and wrinkles), Licorice Root, Collagen etc. If you don’t want to use several products or just want a simple day look, this is perfect. You get your anti-aging benefits and hydration from the serum, the protection from the built-in mineral sunscreen and the coverage from a decent foundation. It’s a huge timesaver and delivers what it promises. The shade range needs improvement (specifically for very pale people with neutral undertones and very dark skin tones). May not work on either very dry skin (not hydrating enough on its own) and very oily skin (not enough staying power on its own). In terms of staying power, you might be able to fix this with a primer and setting powder and blotting in between touch ups. To fix the hydration issue, you might want to first apply a good moisturizer and primer too. All this needs to be tested on the individual. Some people might not approve of the strong citrusy smell due to the natural oils that this product contains. Although it doesn’t linger, people with sensitive skin tend to react to fragrances of any kind – even when they are natural oils – they are irritants. The same applies to the rather long list of ingredients most BB and CC creams have in general (check for fillers etc.). My Tip: If you love a light, natural skin-like finish but can’t wear CC creams or BB creams due to the number of ingredients, try out a water based foundation. The new generation of sheer bases feel just as light as a tinted moisturizer or BB/CC cream. Often with high end products they try to avoid a long list of ingredients, i.e. fillers etc. What are your experiences with the CC+ Your Skin But Better Cream? Do you have either dark or very pale skin and find it works for you? Can you recommend other newer generation CC Creams to try? I’d love to hear from you. ← My precious. Cocoa Delights – Too Faced Chocolate Bar Palette. Review and Swatches.